On a side note: The packaging is something Topps should look at rather than what it uses. You did a parody of Chewy-Louie?! I assume that one was in reference to the wrapper from my collection and archives. I don't know of another example out there in the world. 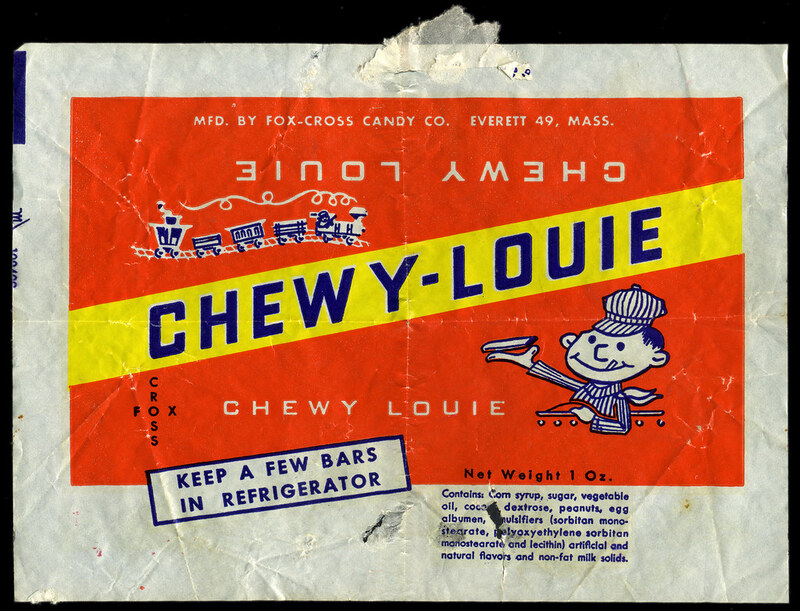 Chewy-Louie was a clear knockoff of Schutter's Bit-O-Honey at the time, as the wrapper design and colors were dead on "inspired-by", but Fox-Cross was not just a manufacturer with copycat products as they were also the longtime (and, I believe original) manufacturers of Charleston Chew. Actually, you can thank Chad for the concept and art! He's the mastermind behind Gooey. Yes, I like vintage candy packaging. That one was in the files for awhile and seemed like a good one for the Halloween set. Thanks, Jason. I've seen a lot of candy and gum products in my time, but never this one. Nice to see my archives and collection still inspires. Absolutely Jason! In fact, that "Oodles of Noodles" design you posted a few years ago, is still one of the only decent examples I've seen on the web! Very gracious of you to post some of these for our enjoyment! On a completely different note, I'd like to mention again that the "Gooey Louie" and "Brain Blo" concepts and art are by Chad! I inadvertently credited Paul as the concept writer for both concepts in the credit line. Paul wrote the "But a finger", "Mr Crowbar" and "Skull" concepts. and Robert made both "But a Finger" and "Mr. Crowbar" his own creations, doing a great job as always! Same with Jason, I didn't know he had worked on Skull until I saw the set myself, a nice surprise! P.S. wasn't there a pic of the set someone took down? No spoilers, if someone didn't get their set yet, I don't think they are going to get one. "Clean Up on Aisle 13" breaks record! If you look down at the very bottom of the main forum screen (where it states who is logged in, etc.,) you'll notice the most online ever was "143." Now look at the date beside the number. It seems the last midnight madness sale broke the all time record! Congratulations, Neil! Here are my 2 paintings for the set (plus my digital sketch for But A Finger)...changes were made for the final cards. Thanks to Paul Harris for offering up these ideas! These are available for purchase. if anyone is interested just PM me! Thanks Rob! I couldn't have done it without you (and 142 others)! Thank you Neil, it was fun! The original But A Finger art has sold. Mr. Crowbar is still available. I'm curious about the technical aspects of putting together a small print run set like this. Do you print the cards yourself or is there a service you use? When I've looked at having cards printed by large presses, they charged basically the same rate for 1000 cards and 100 cards. Good question! The primary reason I do these small releases is for the fans. While they may not make any money (apart from maybe the original art sales), I definitely think it's worth it! As far as production, I prefer to do most of the work myself to keep costs down and maintain quality control. Printing costs all depend on the size of the run, the number of cards and the stock you choose. Because I like to print offset (a pre-digital standard), I have to do minimum runs, so I pay more overall, but the price per card is less and the quality of the product is much, much better than digital. Anyway, if you ever decide to do a set, I'll be happy to discuss with you in more detail. Just be ready for a lot of work but a lot of enjoyment! Have you ever considered holding back a number of uncut sheets for sale? 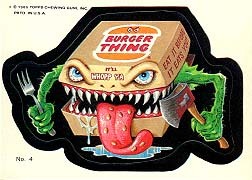 Just saw this on ebay, someone did a sketch card of my Gooey Louie. Cool!